except that for duplication costs etc. 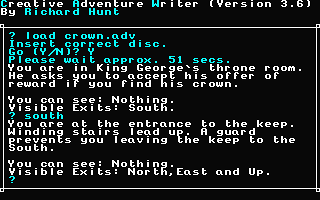 adventure (a first attempt) is CROWN. most out of CAW, have fun. up as you play by customising each location you come to (e.g. them then you need only know the following basic commands. entered when requested, otherwise edit (password) should be used. when it is caused through a trigger. above the location description in edit mode.
! Exit type                    ! Visible ! Hidden !
! Normal                       ! 0    ! 5   !
! After trigger 1              ! 1    ! 6   !
! After trigger 2              ! 2    ! 7   !
! After trigger 1 and 2        ! 3    ! 8   !
! After trigger 1 or 3         ! 4    ! 9   ! extremely few commercial adventure have this many! up an object in your inventory type !bring (object). which require that object to be picked up. giving a sullen atmosphere. Exits lead north and south. be done on the location string forcing manual formatting. this and everything else will be explained in more detail later. this happens, again this has to be manually formatted with \. only), the scroll will not however be removed. through the use of an apostrophe. work in trigger 1 then spanner would have to be object 1.
the limit is passed in the game. inventory. Triggers should not clash with the CAW commands. added to display instant text after the trigger. result in the followig text being printed up and the game ending. extra options for anyone who finds it alright. 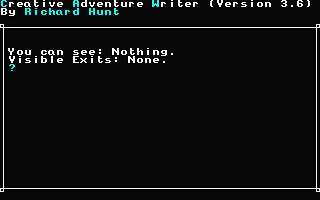 it is a useful way of ending an adventure when it is completed. description the more powerful the image it conjures up. could prove too frustrating and almost impossible. automatic trigger) as the trigger can now take place. get the key and then to unlock the door!!! one you can remember instantly. 26!) the text was formatted on entering.